The road to the ARDA Language Centre, where the C.H.S. and S.E.F. 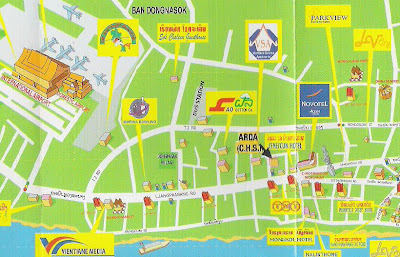 services are held, is located about 150 metres beyond the Mercure (formerly the Novotel) Hotel on Avenue Souphanouvong - the Luang Phrabang Road (on the right hand side leaving town). The road is next to a PV Oil gas/petrol station. The Centre is about 100 metres down this road on the right hand side. Once you reach the Centre, go through the gate, turn right and you will reach the entrance to the building. We meet in a room up the stairs at the right hand side of the reception area. At the top of those stairs turn right and you'll have arrived!